I hope that you’ve been enjoying the summer months. It seems the older I grow, the more quickly summers fly by. So I’m cherishing every warm day! Knowing how busy most people are as the summer winds down, we decided not to publish our August ministry magazine. This is not to say, however, that we’re giving ourselves a break, or that the pressing needs faced by our spiritual family around the world have eased. In fact, I must tell you about one very special member of our family whom we’re going to soon be helping. I can’t tell you her name, because as you are reading this, she is incarcerated in a North Korean prison camp. At her trial, she was sentenced to 15 years of hard labor. Her crime? Telling someone about Jesus. By means of some covert operations, our partners have been able to smuggle food and medicine to her. (It is estimated that each year, 25-35% of the inmates in North Korea’s prison camps die because of harsh conditions and malnutrition.) Also, through a few strategic bribes made during a time when less suspicion would be raised (namely, during the nationwide birthday celebration of North Korea’s first dictator, when prisoners are sometimes given reduced sentences to demonstrate the current dictator’s “compassion”), her sentence was reduced to 8 years and her workload lessened. It is unlikely, however, that she will survive those 8 years. In a few months, there will be another nationwide celebration in North Korea, and that occasion will provide the opportunity to bribe the right people once again to secure our sister’s full release. The estimated cost of those bribes is $6,000, and there will be another $2,000 needed to smuggle her out of North Korea using an Asian “underground railroad.” Lord willing, she will then be reunited with her daughter in South Korea, who escaped from North Korea about two years ago. This may all sound like cloak and dagger, but it is not fiction. We’ve been blessed to play a part in rescuing other believers inside North Korea who were facing imminent prison sentences and on the run from communist authorities. And, not too long ago, National Geographic magazine published an excellent article titled Escape from North Korea that you can read here: HeavensFamily.org/nk/ng. If you want to learn about North Korea’s prison camps and see actual satellite photos, visit http://freekorea.us/camps. 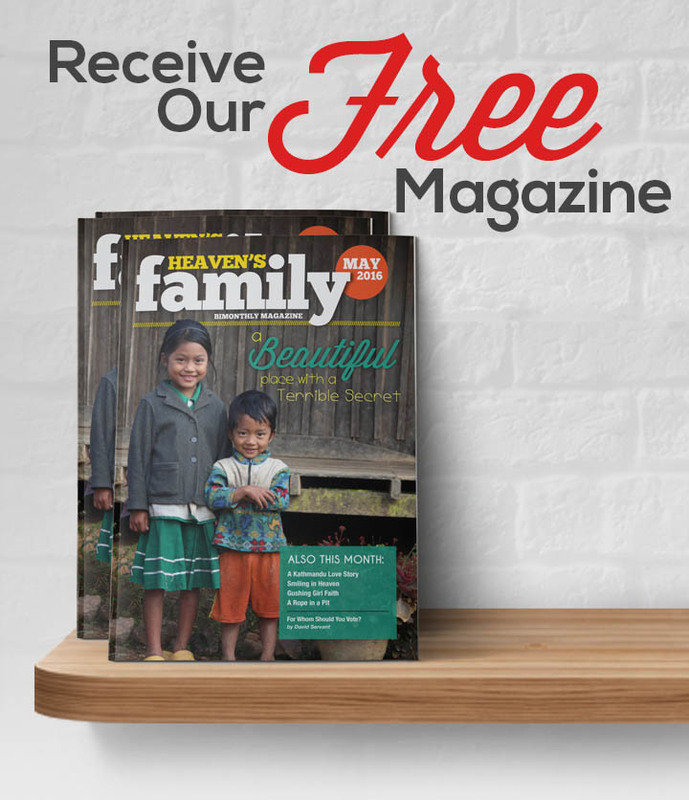 Your gifts to Heaven’s Family’s North Korean Christians Fund this month will help us secure our sister’s freedom. If we happen to receive more than is needed, 100% of the extra funds will be used to help other North Korean believers in similar situations. To contribute to the North Korean Christians Fund, please click here, and to contribute to any of Heaven’s Family’s many other specific funds, click here. (All of those funds need help.) Or, if you prefer, you can make a contribution by calling our office at (412) 833-5826 (M-F, 8:30 – 5:00 ET). Because of your compassion, we can continue to care for orphans, widows, the desperately poor, the persecuted, the hungry and thirsty, and so many more. Please take a few minutes of your time to ask the Lord whom He would have you serve in August! On their behalf, thanks so much. P.S. Your gift is often the answer to the prayers of one of our spiritual family members. Thanks so much for helping us help them during August, a traditionally slow month for most ministries.